The Wars of Pooch: Force on Force- Australians! So, my painting progress has slowed a fair bit, but what I am working on right now is a Dark Ages SAGA army (because SAGA is cool!) and also as a wee group we are painting up some 28mm Pacific War WW2 guys, to play a modified version of Force on Force, which we think will be a heap of fun! More on the rules part in the coming weeks, primarily because we haven't got them all nutted out just yet! So I have opted to take charge of the Australians, basing them around the 6th Australian Division, who were part of the gruelling campaign for the Kokoda track (or trail, depending on etymology. I have done a quickie link to wikipedia for this, as honestly I don't actually know that much about the campaign. The Pacific War is a bit of an unknown for me, I have read some wonderful books about the USMC in the war, Robert Leckie and Eugene Sledge's were brilliant, but in terms of my actual knowledge, I know very little. So what I started with was google. I looked at images, at descriptions and at reports and certianly the Australians stood out to me. The Kokoda campaign was quite simply, brutal. A fight against the elements, disease, malnutrition and against a ruthless enemy, the Australians fought with courage and dignity. The overall scheme of the campaign was one of next to no logistical support, of small unit actions all because the track is simply too small to bring up large equipment, if you wanted something, you were going to have to carry it on foot! 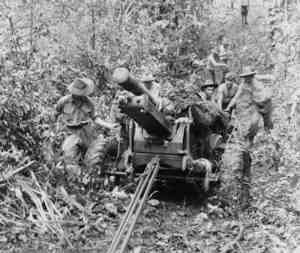 But carry it they did, both the Japanese and Australians were able to bring artillery pieces to bear on the enemy, lugging them up the track by hand. A 25pdr being manhandled up the track. Photo courtesy of the Australian War Memorial. Here is my first half squad. Complete with an NCO with a Thompson SMG and a Bren gunner, these guys come from Artizan designs and are not too bad a models. I am not sure why, but Artizan don't really do great faces in my opinion, they are a little too... chiselled jawed american GI JOE styled for my tastes. Next up is my AT Team. We have a man with the whopping .55 caliber Boys AT Rifle, with his A gunner. The Boys gunner is from Warlord Games, the assistant gunner is from Artizan. Here we have the last of my Artizan diggers, one will be the spotter for my Sniper team, the other is a spare NCO with a Thompson. The spotter is one of my favourites from the Artizan set. Last but assuredly not least, we have an objective marker for one of our games. It seems that some nasty Zero has shot down this chaps Hurricane! He is a downed pilot from the Warlord Games range, and is looking suitably out of place next to the hardened diggers! There will be a "save the pilot" scenario, and this guy will serve the part nicely! So, that's all I have done now. I got all these chaps from the wonderful people at War and Peace Games seems only fitting to buy auzzies from an auzzie company! Lastly, this happened recently in Libya. All I can say is, those who fell serving their country both here and abroad, deserve peace. In wargaming, I do not seek to glorify war. Only a sociopath could. Instead, it is to remember the history, to remember those who fought, those who fell and those who remain. For he to-day that sheds his blood with me shall be my brother. On that note, take a minute to remember those who are still overseas. The Aussies look great Pooch. For the Kokoda campaign, Fitzsimmon's book is pretty good, but I'd highly recommend the Path of Infinite Sorrow (Collie & Marutani) which also gives a Japanese perspective of the campaign. This book struck a cord with me as the Japanese regiment involved came from a place in Japan called Kochi, a city and prefecture where I lived for three years. I like that picture you sent of the 25 pounder on the track. I agree totally Craig, I need to do more reading! A trip to the library or the book depository has to be on the cards, thanks for the tips about books to look into. I like 28mm models alot at the moment, I just find them much more satisfying to paint, I cant see myself going out of my way to paint more 15mm for a while, not with all the 28mm projects on the go! some Auzzies and Marines holding s redoubt against waves of Jason's Japanese! I don't know enough about New Guinea either. I'll put it on my lists for sure now.